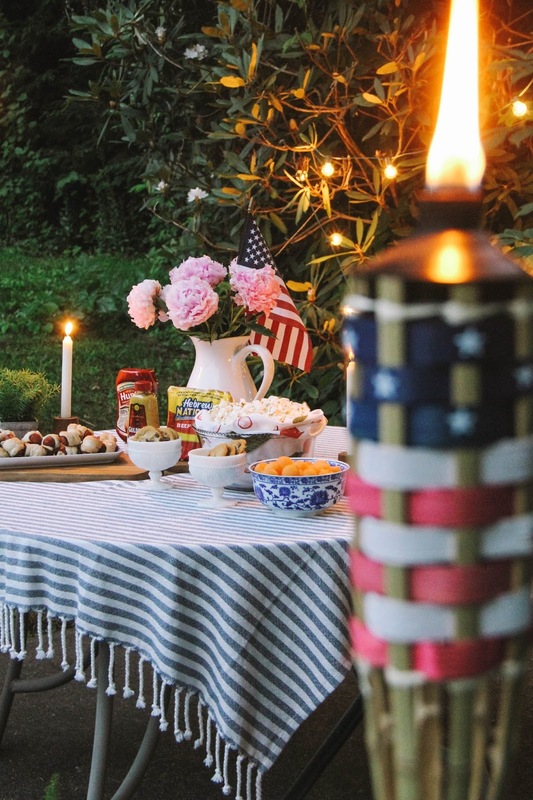 Summer is the perfect time of year to transform your backyard into a charming spot for hosting your people, serving up tasty foods, and hanging out long after the fireflies have come out. 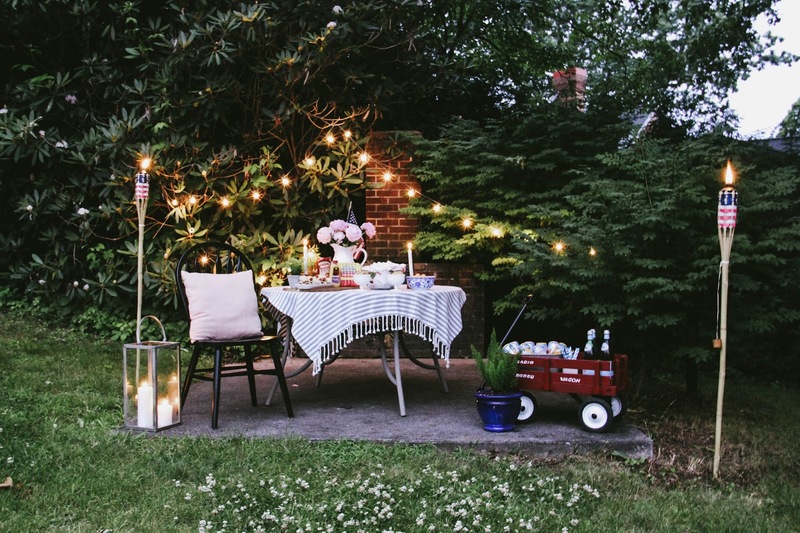 I'm a huge fan of ambiance, so if I'm going to host a backyard soiree, I prefer to do it around dusk, when I can light up the night with strings of patio lights and candles. It makes the evening feel all the cozier, and that is my favorite kind of feeling. When it comes to the food, it's best to keep it simple so you spend more time hanging out than running around the kitchen. Truth be told, I'm not always the best at a simple menu, but I'm getting better and learning. A new recipe that I recently tried out, was a twist on an American classic. 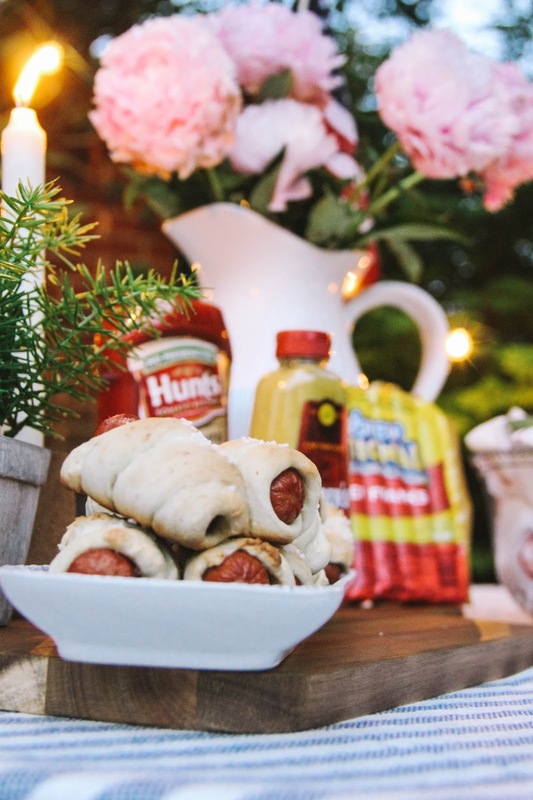 Instead of a traditional bread-wrapped hotdog, I made pretzel wrapped franks, and y'all they're delicious! 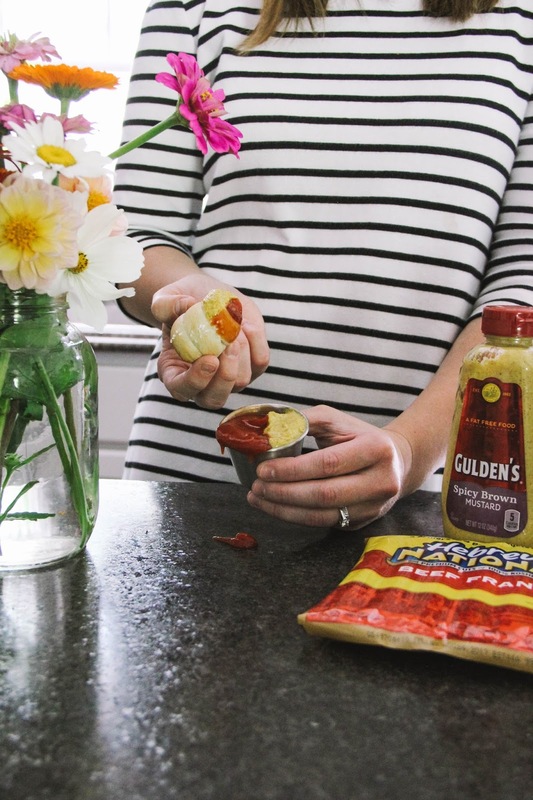 I headed straight to Walmart to get all of my ingredients, from Hebrew National® Beef Franks to Hunt's® Ketchup and Gulden's® Mustard. Hover over the ingredients in the photo above to click through to Walmart.com to purchase them! Like I mentioned, keeping the menu simple is key. 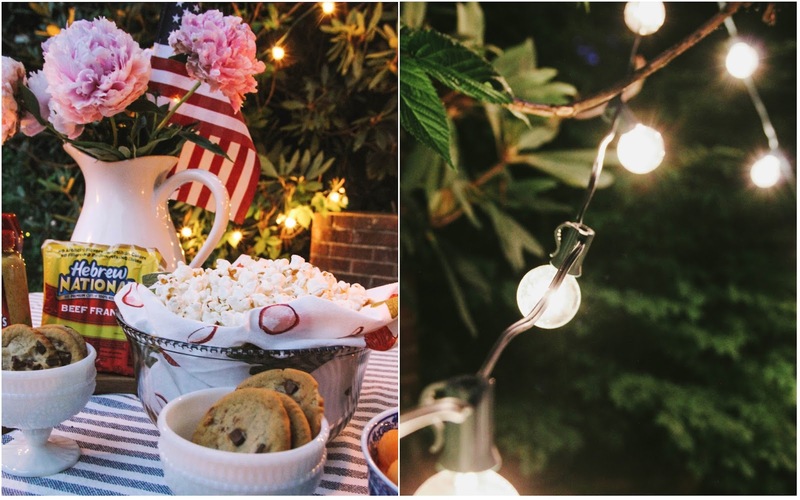 And using what you have around the house for décor, will have you on your way to being the hostess with the mostest ;) After all, with tasty food + twinkle lights you can make any get-together a major success. 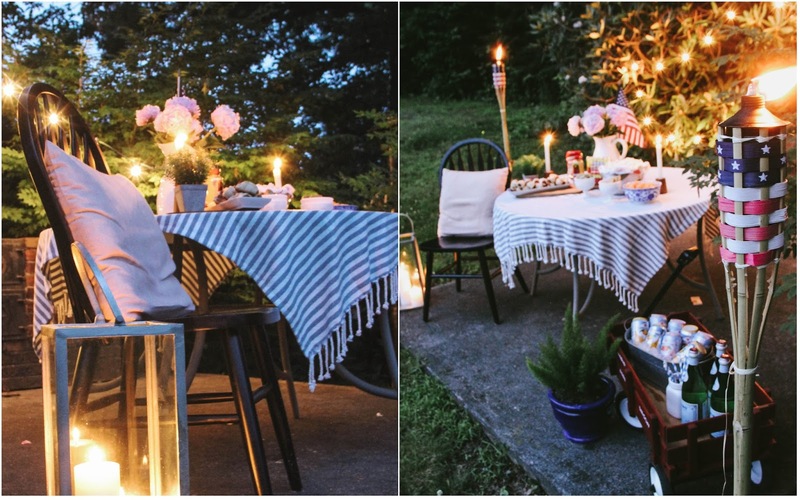 So if you don't have a tablecloth on hand, use a sturdy throw like I did to add a little extra character to the table. Fresh flowers are always an eye-grabber for any tablescape, and sprucing up glass bowls with beautifully printed tea towels is another way to turn the ordinary into extraordinary. 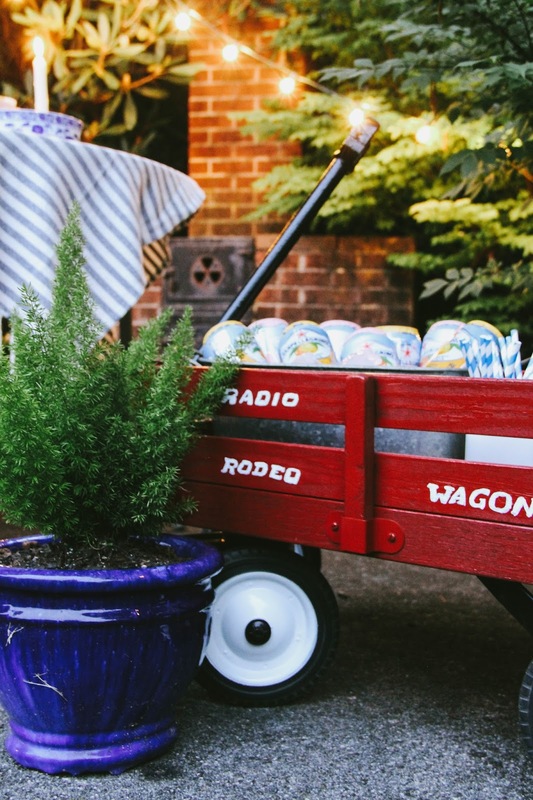 For even more fun, grab a wagon (maybe even a wheelbarrow!) and load it up with your drinks for the evening. Make the pretzel dough according to its instructions. 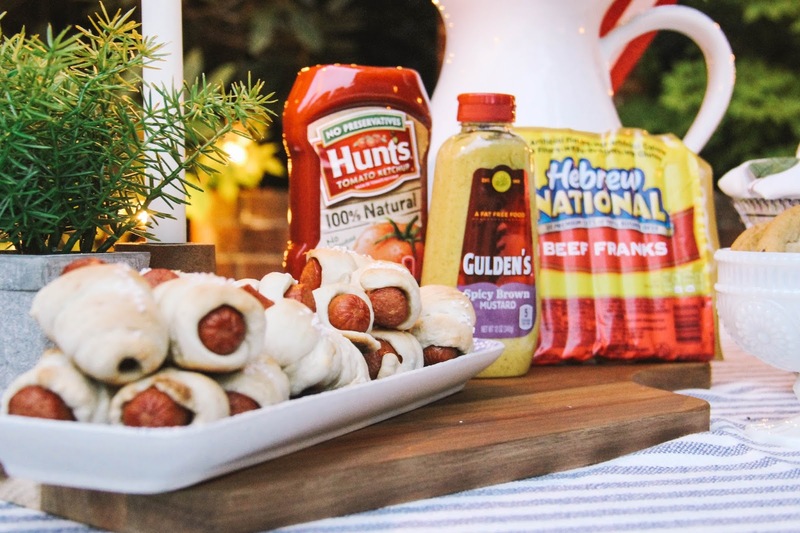 Cut the beef franks into thirds. Pinch off a small lump of pretzel dough and begin to roll it out unitl it's about 6 inches long. Then wrap the dough around the frank. Put on a parchment-lined baking sheet. Repeat this process until the baking sheet is full. Sprinkle the tops of the dough with kosher salt. Bake at 400° for 12 minutes or until golden brown. 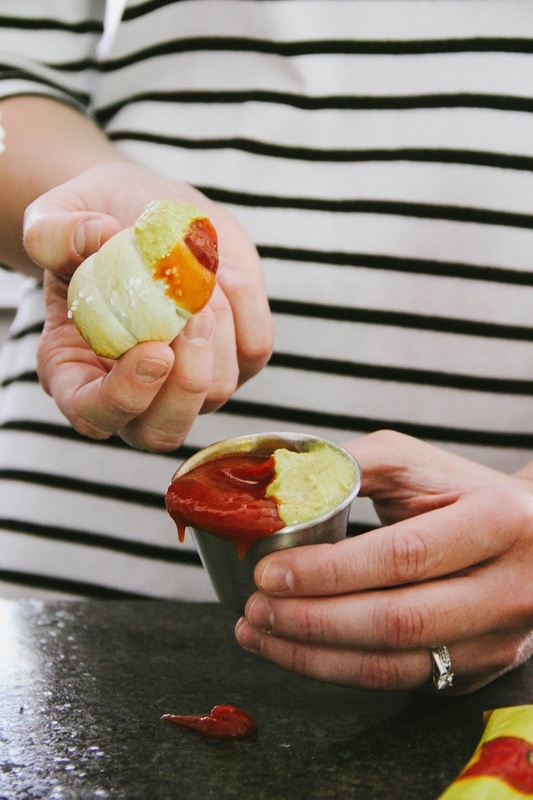 Set the pretzel-wrapped franks out with ketchup and mustard for dipping! 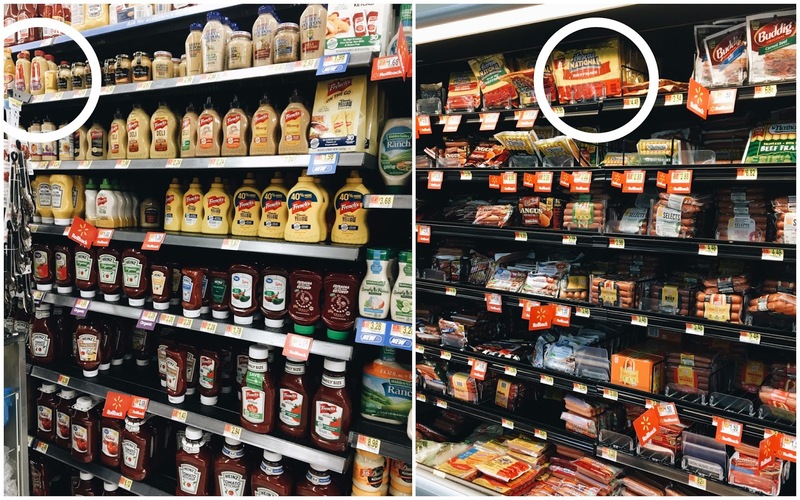 Walmart is your one-spot stop to grab all of your ingredients. They're easy to find, and the store has exactly what you're looking for! For the rest of your table, add foods that are easy to pick up and munch on. I loved having popcorn, cantaloupe (or another melon), and cookies for a sweet treat. Set all of the food out just before your guests arrive so that it's at its peak freshness! And if you feel so inclined, put some soft music on for a little background noise. 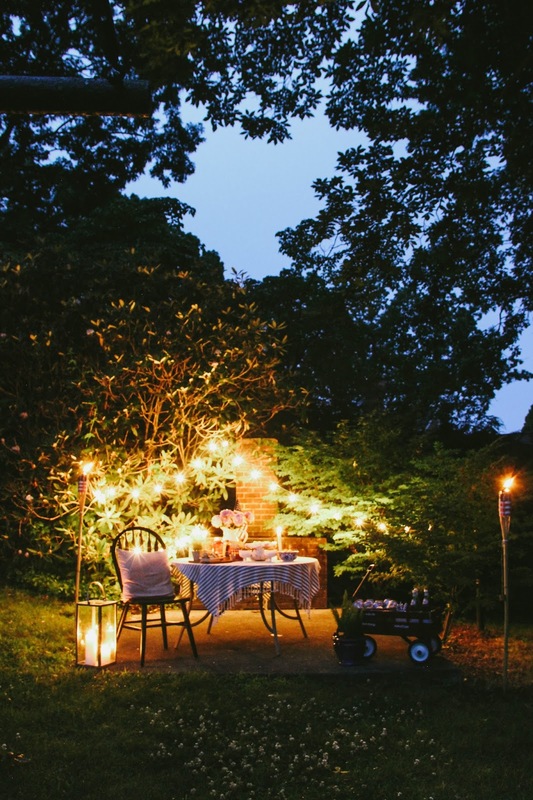 Light the tiki torches and candles, plug the lights in, and you're ready for evening of fun under the stars. 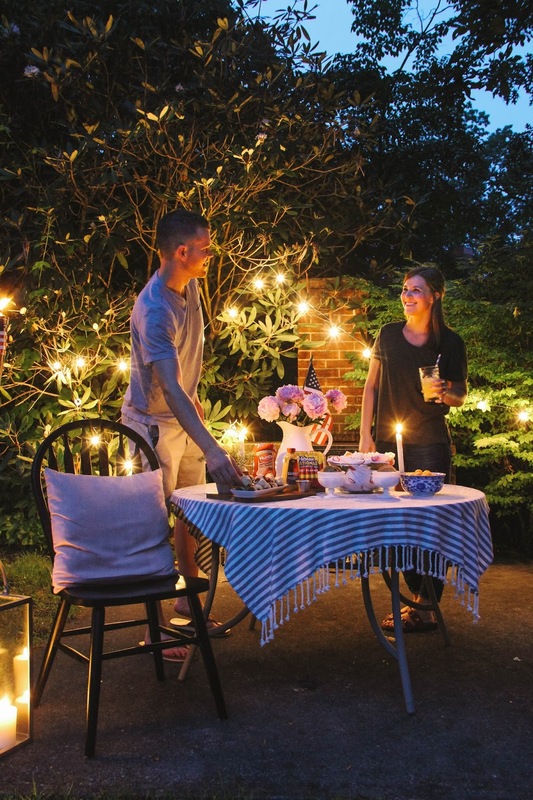 Looking to summer to certify your backyard/patio, or host the ultimate summer block party? 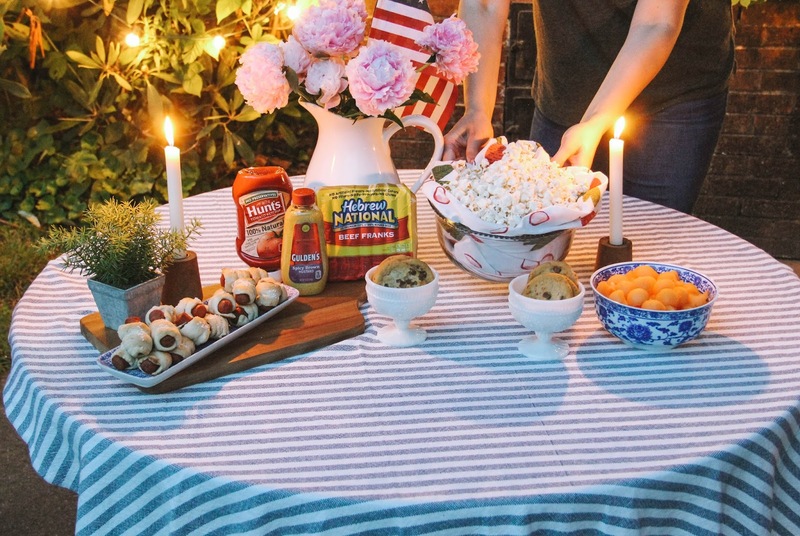 Check out the #StarsOfSummer Sweepstakes where you have a chance to win a $50 Walmart gift card almost everyday leading up to Labor Day (ends 8/31) as well as enter into the drawing for a $750 Walmart Gift Card grand prize. Winner selected on or around 8/31! No Purchase Necessary. The #StarsOfSummer #Sweepstakes begins on June 2, 2018 at 12:00:00 AM ET and ends on August 31, 2018 at 11:59:59 PM ET. There are multiple Entry Periods during the Sweepstakes. Legal residents of the 50 US/DC only, 18+. Void where prohibited. By participating you agree to Official Rules at https://starsofsummerrules.pgtb.me/9WpnNS. 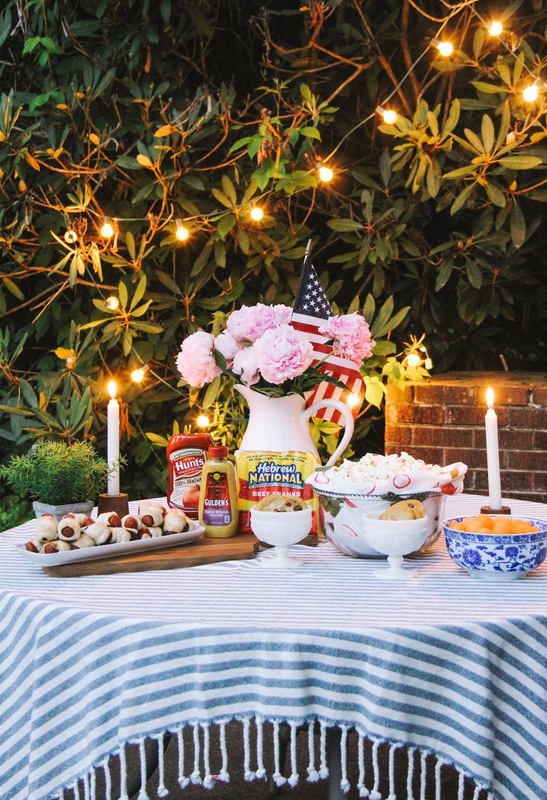 When sharing, Entrant should include the following: "#StarsOfSummer #Sweepstakes. Ends 8/31/18. See Rules at https://starsofsummerrules.pgtb.me/9WpnNS."